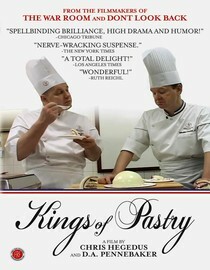 compared to Kings of Pastry, finally available via Netflix. this fine documentary didn’t make it anywhere close to these parts during its theatrical run. what took place were three days of patisserie competition at the highest levels of the craft. no stupid challenges, no eliminations, no personality clashes, no made-up drama: just men (all sixteen competitors were male) creating amazing confections and architectural marvels out of spun and blown sugar. a beautiful movie. the saddest part is at the end when you realize you have the most ridiculous craving for cream puffs and there isn’t a French patisserie in town. with four of the five director nominees having solid tracks, and two (Aronofski and Fincher) doing what is widely considered their best work, and Christopher Nolan (not even a nominee) doing the dazzling Inception the Oscar goes to… Tom Hooper? for a period drama? whose idea was to bring out Kirk Douglas and make him talk? source | Home | Kentucky.com. is there anything more badass that a rabbit in armor charging into battle? kittens, they have kittens! buy one, get five free!